We offer Copper Bonded Earth Rods that eliminate electrolytic action and also effectively reduce the chances of corrosion. The components used for their fabrication are of high grade that ensure their optimum performance. Our products meet the requirements of our clients and are in compliance with industry standards. JMV’s UL Listed Copper Bonded Grounding Rods are made of excellent quality raw material & are globally accepted for doing Grounding with extended long life.Copper Bonded Grounding Rod is made from low carbon steel with a high tensile strength of at least 600 N/mm2 which is molecularly bonded with 99.99% of pure electrolytic copper. More than 30 Years Service life. State of art manufacturing techniques. Copper Bonded Rods are more effective than GI earth electrodes. JMV is up with an earthing system involves carbon-based steel rod along with 250 microns of 99.9% coating of copper. The steel core provides a high tensile strength and the copper stamps the excellent conductivity. Copper Bonded Earth rods evade the drawbacks of conventional technology and contain no hidden factor. 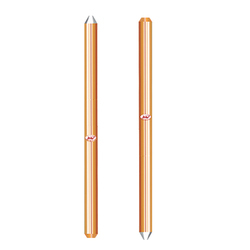 JMV is one of the India's leading manufacturer of Ul 467 listed Copper Bonded Grounding Rods available in single type and sectional type rods style. The product is made up of high carbon steel with an electrolytically applied copper finish. Our Copper Bonded Grounding Rods is applicable for necessary ground for all major projects including substation poles, construction tower etc. We are leader in manufacturing and exporting premier quality and reliable diverse variety of Maintenance free earthing for electrical earthing. Earthing is a major requirement for protecting human life, electrical & electronics appliances and etc. Looking for Copper Bonded Rods ?